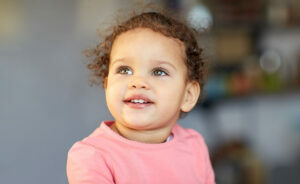 At 2 years old, your toddler is working on several developmental milestones. She’s perfecting her motor skills, like running and jumping. She’s learning new words everyday, and she’s becoming more independent by the minute. So many big changes! In a time filled with such advancement, you may find that your 2 year old is also struggling with sleep problems. When children advance in one area, like physical development, they often regress temporarily in another area, like sleep. It’s perfectly normal. Also, sleep needs and patterns change around the 2 year mark. We often have to tweak our toddler’s sleep schedule around her second birthday. Common sleep problems for 2 year olds are resisting bedtime, waking at night, wanting to sleep in their parent’s bed and fighting naps. In this article I guide you through these common sleep struggles, what causes them and how to fix them. One thing that prevents toddlers from sleeping through the night is a late bedtime. Late or inconsistent bedtimes make your toddler sleep worse, not better. A long nap (or late nap) can make your 2 year old fight bedtime. He’s not tired enough to fall asleep! Make sure your toddler’s nap time falls right in the middle of his day. Plus, at 2 years old, I recommend limiting naps. Many moms cringe when I suggest limiting naps. I get it! You treasure your 3 hours of uninterrupted downtime. It’s definitely a trade off. If you want your toddler to keep an early bedtime, limit his naps. You can also choose to keep a long nap and push bedtime later. As your 2 year old becomes more independent, she’ll want to test her boundaries. She’s figuring out how much she can get away with! It’s normal toddler behavior to push the limits and “question” why she always has to go to bed at the same time each evening. A great way to combat this is to have a firm ending to your bedtime routine. Pick a “point” like a certain song or a specific book that will signify the end of your bedtime routine. For example, you could sing ‘Twinkle Twinkle Little Star’ at the end of your bedtime routine each night. You sing it twice each night, and after that, the lights go out and your little one goes to sleep. You never deviate from this by giving in to demands to read another book or sing another song. A bedtime routine checklist can help your toddler visualize and better understand her routine. (see some popular bedtime charts below). Hang one on your toddler’s bedroom wall and go through the same steps every evening. Point to each activity as you do it and say, “Look, we’re putting on pajamas and next we’ll read a book.” This builds consistency into your routine and helps your toddler accept it more easily. Once you reach the final step, your little one will know that it’s time to fall asleep. There’s good news with this regression. It’s the last one and it’s often shorter and less intense than the others! It’s possible to get past it quickly and go back to sleeping well (find out more on sleep regressions here). If your 2 year old was sleeping like a champ before this regression hit, then do your best to stay consistent. Keep up with your familiar sleep routines and timing. Your little one may need extra comfort or support, but try not to deviate from your typical sleep routines too much. This will help your toddler go right back to sleeping well once the regression passes. Specifically focus on keeping your child falling asleep on his own at bedtime and during the night. If you start rocking him or bringing him to your bed, he’ll plan on you continuing this after the regression passes. If your 2 year old wasn’t sleeping well before the regression, there’s no better time to begin learning healthy sleep habits. Start by creating a Peaceful Nightly Ritual. My free Exhausted Mom’s Survival Kit walks you step-by-step through getting your little one sleeping well. Separation anxiety peaks around 18 months, but it can resurface around the 2 year mark. If your little one is going through big changes like switching daycares, welcoming a new sibling or potty training, separation anxiety can increase. In times of change, your toddler’s sleep may suffer and she’ll look to you for comfort and stability. Separation anxiety makes your 2 year old unsettled when you’re not around. It’s a normal phase of development, and not necessarily a sign that something is wrong. The intensity varies from child to child. The best way to handle it, is to spend as much time as possible with your little one. Find moments to spend quality time together, especially before bedtime. Do a lot of cuddling, kissing, story telling, and chatting about your day. Show her that you’re there for her. Tell your child how much you love her, which helps her feel safe. Try to not be distracted by your phone or the multitude of chores waiting for you. When it’s time to sleep, explain to her that you’re always nearby. It’s important for her to hear this, because she’s growing up and becoming independent, which typically comes with a bit of fear. If your toddler gets very upset with the idea of sleeping alone, sit in a chair in her bedroom while she falls asleep. You may need to do the same if she wakes during the night. This is a great way to keep your familiar sleep routine of her sleeping in her bedroom, but adding in some extra comfort. A lovey can be any item that offers comfort to a child. Typically it’s a blanket, a piece of soft cloth or a stuffed animal. It’s a “buddy” that helps your 2 year old through tough times, as she transitions from dependence to independence over the first few years of life. Encourage your toddler to cuddle and sleep with her buddy to “keep her company” in the night. Nightmares, or bad dreams, make your toddler wake in the night crying and scared. It’s normal for 2 year olds to have bad dreams, but there are also things you can do to reduce their frequency. Nightmares are caused by overtiredness, a growing imagination, certain books and videos, or recalling a scary event from the day like an encounter with a big dog. It’s possible to wake your child from a nightmare, give him comfort and explain that it’s not real and he’s safe. Night terrors are different. During night terrors, it’s impossible to wake your little one. You just have to sit next to him and wait it out. Most children don’t remember them, though. Night terrors are caused by chronic overtiredness, stress and anxiety, sickness or jet lag. Always make sure your toddler feels safe in his bedroom. Remove any objects that he might be scared of, like older brother’s toys, posters on the wall or stuffed animals. Offering a lovey also helps him feel safe and comforted. Have a discussion to find out if something is scaring your little one or making him feel uncomfortable. Talk it through so you can better understand. And always remind your toddler that he’s safe and mommy is always nearby. If your 2 year old ditched the crib a while ago, don’t lose hope! It’s 100% possible to keep your little one in his toddler bed all night. This article explains what to do. If your 2 year old snores occasionally, especially when she’s sick, this can be normal. But if snoring is a regular occurrence and your toddler seems tired during the day it could be sleep a sign of a bigger problem and I recommend you tell your child’s pediatrician. Constant night wakings are exhausting! While night wakings can be expected for babies who need to feed during the night, your 2 year old can be expected to sleep 11-12 hours straight at night. If your toddler is a good sleeper who’s recently started waking in the night, it’s probably due to one (or more) of the above sleep problems. Following my advice should get his sleep back on track. But if your little one has never been a good sleeper, it’s time to do something about it. You can teach your little one to settle himself to sleep and sleep through the night in his own sleep space. It’s never too late! The better a child rests during the night, the more happy and adaptable he is during the day. Same goes for us parents too, right? How terrible is your next day, after you’ve had a bad night’s sleep? Solid sleep helps us all feel better. If you’re ready for your 2 year old to sleep better, join my free Exhausted Mom’s Survival Kitand let me walk you, step-by-step, through transforming your child into a great sleeper! So there you have it. The seven main sleep problems that 2 year olds struggle with. Remember, there’s always hope to get your little one sleeping well. It’s never too late! Whether your toddler is going through a sleep regression, separation anxiety, learning to test limits or needs a tweak in his sleep routine- this article walks you through what to do. Good luck! Got a question about your 2 year old’s sleep? Ask Jilly in the comments below.